Layered architecture has been the norm in enterprise projects for quite some time now. We layer our solutions into groups of responsibilities: UI, services, data access, infrastructure and others. We can connect these layers by setting references to them from the consuming layer. There are various ways to set these layers and references. The choices you make here depend on the project type – Web, WPF, WCF, games etc. – you’re working on and the philosophy you follow. How does the Customer fit into our domain? Have we modelled the Product domain correctly? Is this logic part of the Product or the OrderItem domain? Where do we put the pricing logic? Technology-related questions will suddenly become implementation details where the exact implementation type can vary. We don’t really care which graph package we use: it’s an implementation detail. We don’t really care which ORM technology we use: it’s an implementation detail. Of course technology-related concerns will be important aspects of the planning phase, but not as important as how to correctly represent our business in code. In a technology-driven approach it can easily happen that the domain is given low priority and the technology choices will directly affect the domain: “We have to change the Customer domain because its structure doesn’t fit Linq to SQL”. In DDD the direction is reversed: “An important part of our Customer domain structure has changed so we need to update our Linq to SQL classes accordingly.”. A change in the technology should never force a change in your domain. Your domain is an independent entity that only changes if your business rules change or you discover that your domain logic doesn’t represent the true state of things. Keep in mind that it is not the number of layers that makes your solution “modern”. You can easily layer your application in a way that it becomes a tightly coupled nightmare to work with and – almost – impossible to extend. If you do it correctly then you will get an application that is fun and easy to work with and is open to all sorts of extensions, even unanticipated ones. This last aspect is important to keep in mind. Nowadays customers’ expectations and wishlists change very often. You must have noticed that the days of waterfall graphs, where the the first version of the application may have rolled out months or even years after the initial specs were written, are over. Today we have a product release every week almost where we work closely with the customer on every increment we build in. Based on these product increments the customer can come with new demands and you better be prepared to react fast instead of having to rewrite large chunks of your code. I’ll start with stating what’s definitely not the goal: give a detailed account on all details and aspects of DDD. You can read all about DDD by its inventor Eric Evans in this book. It’s a book that discusses all areas of DDD you can think of. It’s no use regurgitating all of that in these posts. Also, building a model application which uses all concepts from DDD may easily grow into full-fledged enterprise application, such as SAP. Instead, I’ll try to build the skeleton of a .NET solution that takes the most important ideas from DDD. The result of this skeleton will hopefully be a solution that you can learn from and even tweak it and use in your own project. Don’t feel constrained by this specific implementation – feel free to change it in a way that fits your philosophy. However, if you’re completely new to DDD then you should still benefit from these posts as I’ll provide explanations for those key concepts. I’ll try to avoid giving you too much theory and rather concentrate on code but some background must be given in order to explain the key ideas. We’ll need to look at some key terms before providing any code. I’ll also refer to ideas from SOLID here and there – if you don’t understand this term then start here. Also, it would be great to build the example application with TDD, but that would add a lot of noise to the main discussion. If you don’t know what TDD means, start here. …where the layers communicate with each other in a loosely coupled manner through abstractions. It should be easy to replace an implementation with another. Of course writing a new version of – say – the repository layer is not a trivial task and layering won’t make it easier. However, the switch to the new implementation should go with as little pain as possible without the need to modify any of the other layers. The Web layer implementation will actually be a web service layer using the Web API technology so that we don’t need to waste time on CSS and HTML. If you don’t know what Web API is about, make sure you understand the basics from this post. UPDATE: the skeleton application is available for download on GitHub here. EntityFramework has created a DbContext and the Customer class for us. As you can see the final price discount depends also on the amount of money spent by the customer, not just the value currently stored in the database. So, that’s some extra logic that is now embedded in this CustomerService class. If you’re familiar with SOLID then the ‘_objectContext = new ModelContext();’ part immediately raises a warning flag for you. If not, then make sure to read about the Dependency Inversion Principle. The type ‘System.Data.Entity.DbContext’ is defined in an assembly that is not referenced. You must add a reference to assembly ‘EntityFramework, Version=4.4.0.0, Culture=neutral, PublicKeyToken=b77a5c561934e089’. So I import the EntityFramework library into the DomainLogic layer to make the project compile. It’s immediately obvious that the UI layer can easily bypass any logic and consult the data access layer directly. It can read all customers from the database without applying the extra logic to determine the price discount. Is it possible to replace the MVC layer with another UI type, say WPF? It certainly is, but it does not change the dependency graph at all. 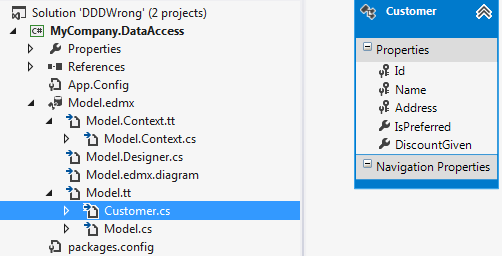 The WPF layer would also need to reference both the Logic and the DataAccess layers. Is it possible to replace the data access layer? Say you’re done with object-relational databases and want to switch to file-based NoSql solutions such as MongoDb. Or you might want to move to a cloud and go with an Azure key-value type of storage. We don’t need to go as far as entirely changing the data storage mechanism. What if you only want to upgrade your technology Linq to SQL to EntityFramework? It can be done, but it will be a difficult process. Well, maybe not in this small example application, but imagine a real-world enterprise app with hundreds of domains where the layers are coupled to such a degree with all those references that removing the data access layer would cause the application to break down immediately. The ultimate problem is that the entire domain model is defined in the data access layer. We’ve let the technology – EntityFramework – take over and it generated our domain objects based on some database representation of our business. It is an entirely acceptable solution to let an ORM technology help us with programming against a data storage mechanism in a strongly-typed object-oriented fashion. Who wants to work with DataReaders and SQL commands in a plain string format nowadays? However, letting some data access automation service take over our core business and permeate the rest of the application is far from desirable. The CustomerService constructor tightly couples the DomainLogic to EntityFramework. 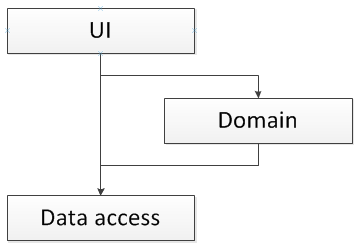 Since we need to reference the data access layer from within our UI even the MVC layer is coupled to EntityFramework. In case we need to change the storage mechanism or the domain logic layers we potentially have a considerable amount of painful rework to be done where you have to manually overwrite e.g. the Linq to SQL object context references to EntityFramework object context ones. We have failed miserably in building a loosely coupled, composable application whose layers have a single responsibility. The domain layer, as stated in the introduction, should be the single most important layer in your application which is independent of all other layers – possibly with the exception of infrastructure services which we’ll look at in a later post in this series. Instead, now it is a technological data access layer which rules and where the domain logic layer is relegated to a second-class citizen which can be circumvented entirely. The domain is at the heart of our business. It exists regardless of any technological details. If we sell cars, then we sell cars even if the car objects are stored in an XML file or in the cloud. It is a technological detail how our business is represented in the data storage. It is something that the Dev department needs to be concerned with. The business rules and domains have a lot higher priority than that: it is known to all departments of the company. Another project type where you can easily confuse the roles of each layer is ASP.NET WebForms with its code behind. It’s very easy to put a lot of logic, database calls, validation etc. into the code-behind file. You’ll soon end up with the Smart UI anti-pattern where the UI is responsible for all business aspects of your application. Such a web application is difficult to compose, unit test and decouple. This doesn’t mean that you must forget WebForms entirely but use it wisely. Look into the Model-View-Presenter pattern, which is sort of MVC for WebForms, and then you’ll be fine. So how can we better structure our layers? That will be the main topic of the series. However, we’ll need to lay the foundation for our understanding with some theory and terms which we’ll do in the next post. This serie will be very intresting to follow. Excellent material you have put in here. I’m pushing forward a DDD initiative in the company I work for. I’d like your permission to translate the contents here to portuguese. I’ll use it as supplementary material for an internal workshop and perhaps publish it, crediting you of course. Thanks for your comment. Feel free to use the material as you wish. Congratulations, this article is very important to complex enterprise apps! Thank you so much for that. Keep on. Very informative series to help developers trying to break old mindsets. Thanks for your comment, Fagro, you can find the links to all parts of the series here. Something is really confusing me about DDD. Recently I read a Microsoft article saying that dbContext already resembles a unit of work and it was pointless creating your own repositories and unit of work. Also it could be easily mocked. However placing the dbContext directly in the service layer will tie the data access technology to the service which you have explained is a bad idea. I’m just not sure what the best practise is with EF 6 dbContext going forward. I’d be very interested to know your thoughts? Btw this is a fantastic resource for people wanting to learn professional c# development. Much appreciated. I think you might want to go through the updated DDD that started some weeks ago. If you check out the Architecture page you’ll find it under the “DDD revisited” section. It’s not over yet, there are 7 more posts to be published at this point. The revised series is different from the old one as far as UnitOfWork is concerned. I used the EF6 db context directly there without any abstraction in front of it but still all technology-specific code is hidden in the concrete repository layer. Yes, the EF6 db context IS a unit of work but in my opinion it doesn’t mean that it should be freely available all over the place in the solution. Otherwise people will be tempted to circumvent the logic implemented in the domain layer. Using the repository pattern with abstract and concrete repos indicates to the callers the operations that are available for the domains. If you want to isolate the concrete repository layer so that the rest of the solution does not depend on it then I think the repository pattern is still the way to go. Thanks for getting back to me. I like the idea of not having the dbContext freely available as well. I’ll check out your new articles to see how your structuring things.